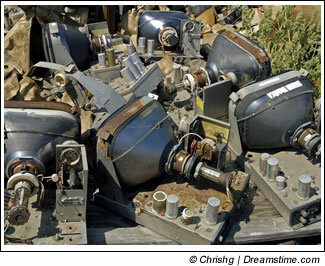 E-waste is the fastest growing part of the waste stream in the US. But we don’t have an effective system for safely managing electronics when consumers are done with them. Most e-waste is trashed – going into landfills or incinerators. The toxic chemicals in electronics should not end up in our landfills (where they can leach into the groundwater) or in incinerators. Burning plastics in electronics gives off deadly dioxin and furans. More on trashing electronics. Even recyclers don’t recycle. They export. Sadly, most of the companies claiming to recycle our old electronics actually are exporting most of it to developing countries. They make more money that way. From 50 to 80% of e-waste that is collected for recycling is actually shipped overseas for dismantling under horrific conditions, poisoning the people, land, air, and water in China, other Asian nations and to Ghana and Nigeria in western Africa. Why? A responsible recycler must do at least some manual disassembly of the products to remove the toxic parts (circuit boards, mercury-containing lamps and switches, batteries, toners, CRTs). But it’s cheaper to sell it to low-wage countries, where this disassembly happens by bashing and burning the products in ways far too unsafe to be allowed in the US. So we are not recycling most of our e-waste, we are dumping it on the rest of the world. See more on Global E-Waste Dumping. The federal Department of Justice runs a business inside the federal prison system, which operates electronics recycling shops inside seven federal prisons. (One has been closed for several months due to health and safety problems.) Most of the federal government’s e-waste goes to these prison operations. More on prison recycling.